And I’ll take it all with me! Look, I can be pretty happy with a hearty chowder and a pile of hand-cut fries. But Knoxville is a well-known test market for fast food/casual dining chains (I’m looking at you, Ruby Tuesday, the veritable Godfather of every TGIO’Crapplebee’s in the US) and that can make finding a mom-and-pop hard to find here. It’s hard to convince people to take a chance on an unknown quantity (read as: no corporate office) when they can get a predictable, if not pedestrian, fajita or drive-thru chicken sticks. No judgment here if you like chains (I have a Velveeta problem), but since my town is riddled with them, my natural inclination is to spurn them. I’d rather give my money to someone who is creative and is skilled–and I’m not being a snob here–craft and skill are necessary in making something even as simple as fried chicken, soup, or a reuben. 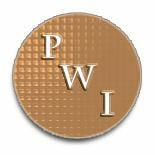 My opinion is that international corporations leave no room for creativity in their kitchens–they can’t by design. This is also why I cook at home so frequently. 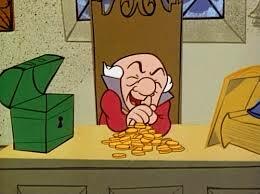 That and the miser thing. We have a few good local restaurants here, and there are some good things are starting to happen down on Gay St, but don’t get me started on Market Square…we don’t have time for that rabbit hole. Foothills Milling Company has been on our list for a couple of years now. The opportunity to go presented itself in the form of reservations with a couple of FMC veterans. We went on a Wednesday night, which incidentally, is when they feature half-price bottles of wine. We started the evening off with some cocktails—there was a Manhattan with house-made apple bitters—delightful; a well-prepared Sazerac; and I had Matt mix me up one of the house specials–the“Winter Old-Fashioned,” which was made with Maker’s Mark, muddled orange & cherry, and brown sugar-cinnamon syrup. Great drink, warmed me in multiple ways on a blustery cold night, and you can bet your sweet bippy that I’m going to try to make that syrup at home. I think it would also be a welcome addition to any brandy cocktail. 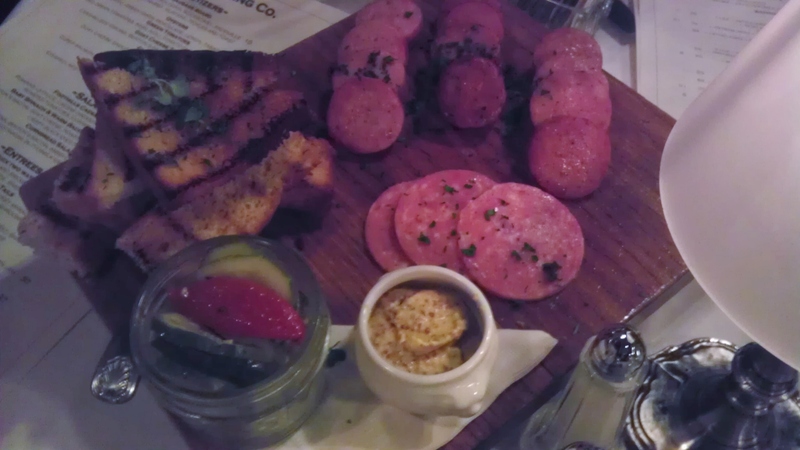 Sausage Board w/plentiful toast points. Thank you universe, for charcuterie. I ordered the goat cheese gnocchi with lamb ragu, because lamb. Just a fantastic dish–tender dumplings that leave you with the delightful tang of goat cheese on the finish. The ragu was uncomplicated and really just elevated the gnocchi, as a proper sauce should. 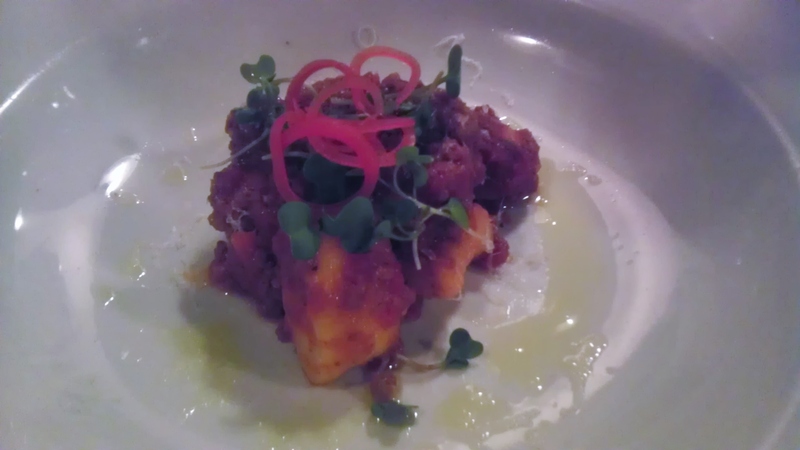 Goat cheese gnocchi w/lamb ragu. And it’s pretty, too! We asked our waiter, Brad (this guy is a gem—make sure and ask for him when you make reservations; this is service of the highest order), if they would consider doing a tasting menu for our table of four, because hey—you don’t know if you don’t ask. He politely told us they’ve never done tasting menus, which prompted us all to make puppy dog eyes, and he chuckled and said he’d pass along our suggestion. Super guy, we were able to share a few laughs, and he’s just a consummate professional. 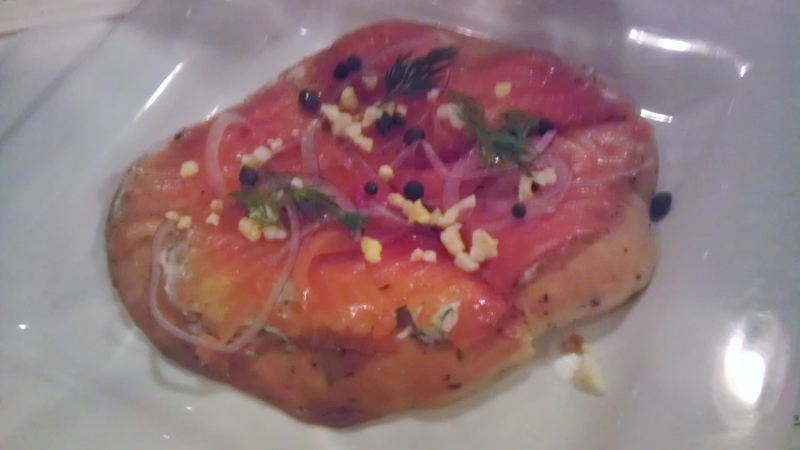 The manager, Patrick, then surprised us with one of their newer appetizers—a flatbread topped w/cured salmon, dill mascarpone, the thinnest slices of red onion I have ever seen, and capers. A well-crafted appetizer, perfect size for sharing. Think: well-heeled lox on a bagel. New salmon flatbread appetizer. I don’t mind being a test market in this instance. Duck Two Ways. 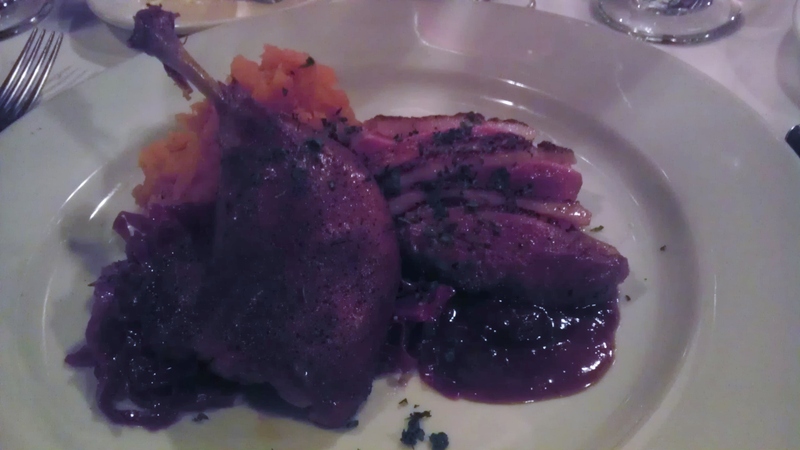 If there is duck on the menu, you can bet I’m going to order it. I’m not going to split hairs here, the entrées are well-described on the menu. Everything was solid–not a single miss on any of the plates. Every entrée was thoughtfully constructed with a great balance of salt-acid-sweet-fatty, and sometimes smoke. My sense is that they cook very clean here, by which I mean they don’t rely on typical restaurant tricks like buttering everything to death or adding a lot of extra salt to cover up any poor quality provisions. The cooking was perfectly executed, and there was no way to miss the expert-level skill in the kitchen. We did all agree that the Pork and Shrimp was the best dish at the table. Hey, somebody has to win the title. The wine list is exceptional. We may or may not have shared bottles of Cloudline Pinot Noir, Layer Cake Primitivo (think European Zinfandel), and a delightful California blend, Besieged. 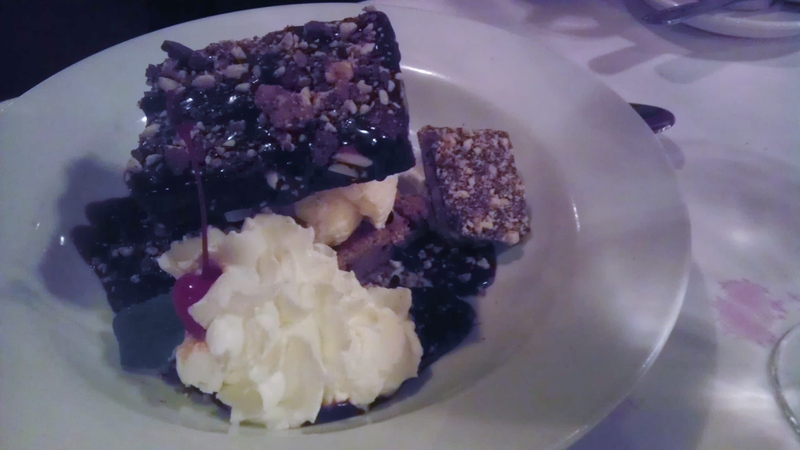 I’m usually not a dessert person, but my tablemates outvoted me, and frankly, I’m glad they did. 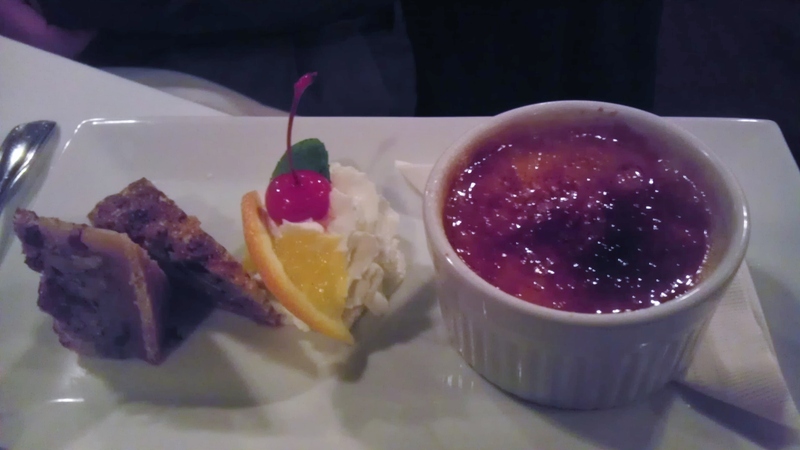 We ordered the Grand Marnier crème brulee, which came with a side of fruitcake. Which sounds wrong. But it was so, so right…and that custard just screamed Grand Marnier! Grand Marnier!, while the fruitcake was delightfully orange-y and texture-y. Yeah, now I’m making up words because there aren’t any to adequately describe this dessert. The ambiance is warm and welcoming, although if you aren’t a regular, be prepared to be noticed as you enter. I thought maybe it was just my fabulous dress and fetching boots, but my tablemates informed that everyone gets the once-over from the patrons if they are not regulars. Harumph. It was a really nice, easy hang, and it seemed as though everyone in the place felt free to laugh and delight in their Dionysian escapades. Erin is a mostly-SAHM. She hates paying for dishes which she herself can make, and considers creating delightful meals from leftovers a high art. I usually sigh every time I am back in East TN and presented with the challenge of finding a place to eat up to my standards. For the longest time I’ve felt pretty meh about even the best reviewed Knoxville dining establishments. Maryville is a bit off the radar for me though as it’s about an hour from my family’s house but I’ll remember this if we are ever in the area. 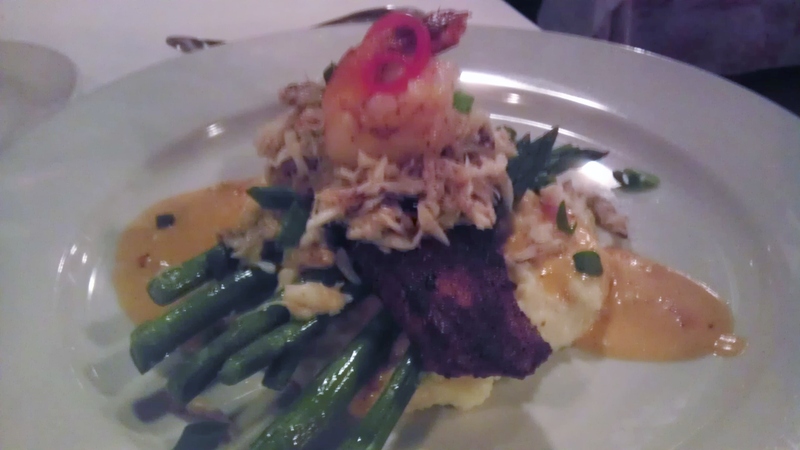 This entry was posted on January 27, 2014 by MusicianMama in Where Are We Eating? and tagged Berkshire pork, cobia, duck, Foothills Milling Company, grand marnier, miser, restaurant test market, toffee.